How to lay sandbags: the right way, the wrong way, and the Army Corps of Engineers way. The future seems to have two probable paths. 1. A dry winter thus far here in the foothills (the high mountains have lots of snow) means extremely high fire danger this spring and summer. Despite Nature's and humans' best efforts, we have not yet burned all the trees around here. My house is well above any potential flood short of the "End of the Ice Age" melt, but if both of two bridges were slammed by floating logs or otherwise knocked out, I would be back in the foot-travel and dog-travois era. The flood potential may last for years. That's what they want to study. Yay science! They did conduct sandbag training today, however. I feel so much better. A neighbor and I laid the first few bags today to protect our shared well house, which sits closer to the creek. All joking aside, isn't it better to do something and also worry instead of just worrying by itself? Labels: fire, flood, spring, Wet Mtns. 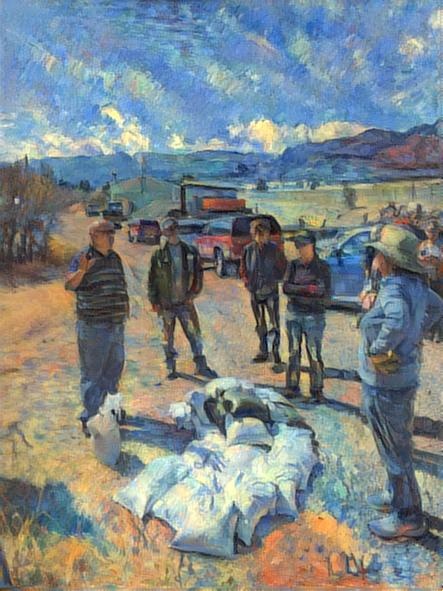 Hi, Chas - That's a terrific painting illustrating the laying of sandbags. Any background information on that, like artist and year, or where you found the image? Modern times . . . it's just an iPhone photo run through a dreamscope.com filter.